Irradiation for Quality Improvement, Microbial Safety and Phytosanitation of Fresh Produce presents the last six and a half decades of scientific information on the topic. This book emphasizes proven advantages of ionizing irradiation over the commonly used postharvest treatments for improving postharvest life of fresh fruits and vegetables to enhance their microbial safety. Prof. Rivka Barkai-Golan has been a senior research scientist in postharvest pathology and mycology at the Volcani Center in Beit Dagan, and a Professor of plant pathology at the Faculty of Agriculture of the Hebrew University of Jerusalem, where she has been honoured a Distinguished Lecturer. She has published more than 150 scientific publications, 3 chapters and 6 books, many of which include irradiation topics. She was the head of the Committee for irradiation research in the Volcani Center, Israel, an organizer of food irradiation conferences and the delegate to the International Conference in Geneva, 1988, by the FAO/IAEA/WHO/ITC-UNCTAD/GATT on the Acceptance, Control and Trade in Irradiated Food. Dr. Peter Follett is a Research Entomologist with the USDA Agricultural Research Service (ARS) in Hilo, Hawaii, where he coordinates research efforts to develop new or improved postharvest treatments to control quarantine pests that restrict the export of tropical fruits and vegetables. He has authored or co-authored 180 scientific publications and is recognized internationally as an expert in the areas of postharvest entomology and commodity quarantine treatment. His research on the radiobiology of more than three dozen insect pests has been used to develop first-ever generic irradiation treatments, which are now used worldwide and have helped expand international trade in tropical fruits and vegetables. Dr. Follett received the Entomological Society of America (ESA) Distinguished Achievement Award in Horticultural Entomology, the USDA Secretary’s Group Honor Award for Excellence, and the Federal Laboratory Consortium (FLC) Award for Excellence in Technology Transfer for his accomplishments in phytosanitary irradiation research and commodity quarantine treatment development. 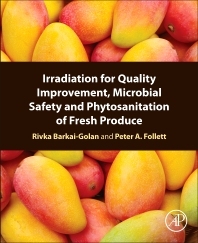 This book written by Rivka-Bakai Golan and Peter Follett is a useful tool for each one implied or interested in the irradiation like a practical method to improve fresh produce safety and quality and to reduce the use of the chemical products. These great demonstrations with the theory about technology, the effects on the products and the living organisms give a focused inventory, country by country, about the applications, of the lawful aspects and the authorizations. This book can be the only customer support for a petition with the national authorities or European about this process.